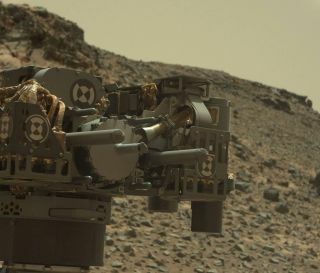 This raw-color image captured by the Mars rover Curiosity's Mastcam shows the robot's drill just after finishing a drilling operation at an outcrop called Telegraph Peak on Feb. 24, 2015. NASA's Mars rover Curiosity experienced an electrical problem last week, and the robot will stay put for a few days while mission engineers try to figure out exactly what happened. The car-size Curiosity rover suffered a "transient short circuit" on Feb. 27 while it was transferring sample powder from its robotic arm to instruments on its body, NASA officials said. Curiosity halted the activity in response, as it was programmed to do in such situations. "We are running tests on the vehicle in its present configuration before we move the arm or drive," Curiosity Project Manager Jim Erickson, of NASA's Jet Propulsion Laboratory in Pasadena, California, said in a statement Tuesday (March 3). "This gives us the best opportunity to determine where the short is." These tests should take several days, after which the consequences of the short circuit should become clearer. "A transient short in some systems on the rover would have little effect on rover operations. In others, it could prompt the rover team to restrict use of a mechanism," NASA officials wrote in the statement. Since September 2014, Curiosity has been exploring the base of Mount Sharp, which rises 3.4 miles (5.5 kilometers) into the Martian sky. The recently obtained sample was drilled from an outcrop called Telegraph Peak. The Curiosity rover is the centerpiece of NASA's $2.5 billion Mars Science Laboratory mission. The six-wheeled rover touched down in August 2012, on a quest to determine whether or not the Red Planet could ever have supported microbial life. Curiosity's analyses of drilled samples were key to this discovery. To date, the rover has drilled and sampled six different Martian rocks, including Telegraph Peak.